At the rate this is going,I might quit going to the cinemas altogether. 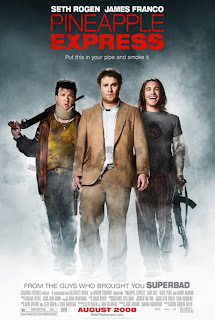 Well,I had been looking forward to watch Pineapple Express for months-not only because it was penned by Superbad writers Seth Rogen & Evan Goldberg,but also because one of my most trusted movie reviewing sites went as far to dub it "The best stoner flick-EVER".Ever is a a weighty word,and Superbad makes me laugh no matter how many times I've seen it. Basically it all boils down to one thing:a damn lousy script.Its sloppy,uninspired and except for the few absurd moments that were actually funny though often disconnected with the bigger picture,so the script works at a standard low enough it wouldn't be odd to re-market it with Adam Sandler in the forefront.It proposes a story that is vacuous with air and much too familiar-right down to the unnecessary 'buddy' arguments that lead into clichéd ''You came back for me'' reunions,all executed with no real zing.Even the few aspiring action scenes (car chase,big showdown at the end involving dozens of guns and of course,a bomb) lack punch and play to music seemingly ripped from lame Tom Cruise blockbusters from the 90s.Aiming for a clever homage effect maybe,but the result is seedy and outdated. As for the stars,the usually likable Seth Rogen brings to the floor the character he plays in every single movie (except that here he's excessively talkative here and almost unbearable) and James Franco is serviceable.Pineapple Express refuses to has its own voice or do anything remotely unique-I wouldn't say its an awful flick,it could qualify as a mediocre B-grade show fitting for a sleepy Sunday evening,to be played while you vacuum the room or lay final edits on an economics assignment.Even then,there'd be hundreds of better B-grade flicks to not pay attention to,so really we best ignore all the hype for this movie and wait for the Judd Apatow fanaticism to fade in a few years,with Pineapple Express being his second major miss (after Forgetting Sarah Marshall-the lesser said about that abominable mess,the better) I'm beginning to have second thoughts and will for now assume Knocked Up & Superbad were more so products of luck than actual talent.Woah,that was crazy harsh.I honestly don't mean that,I just feel really stupid for having paid $14.50 for this doozer. Great review - especially use of the word "doozer". I'm v tired of the whole Rogen Apatow thing now....Can I post this on the site?